Bullying is commonly associated with physical abuse and intimidation, whereas it actually covers a much wider range of actions. A research conducted by the Fortis National Mental Health Programme in 2014 says a whopping 61% respondents reported witnessing bullying in school.1 This data is from about 300 schools in Delhi NCR and applies to all metro cities in the country. As far as solving the issue is concerned, the most important steps to be taken include large scale research, policy initiatives, and awareness campaigns for students. It is also imperative to equip teachers with a comprehensive understanding of bullying and with classroom intervention techniques. Bullying can be defined as ‘unwarranted, aggressive behaviour that involves acts perpetrated repeatedly by one child (or one group of children), who are comparatively powerful (or are perceived to be powerful), on another child (or group of children), that potentially or actually affect the wellbeing of the latter’. Note, there are no ‘bullies’ or ‘victims’ as such; they become so only in relation to each other. Kid A who bullies Kid B can at the same time be a victim of bullying by Kid C. All permutations of this sort are not just possible, but very probable. What kind of acts count as bullying? Injure – injury to body or body part by acts like hitting, stomping, etc. Defile – spoiling appearance by pouring ink, tearing pocket, ruffling hair, etc. Vandalize – (mis)use property or money without permission. Speak – say mean things verbally or through gestures and by name-calling. Write – write/draw/scribble mean things about the person on desks, walls, on their clothes or on electronic media such as SMS, social networking sites, etc. Bust – divulge private information in public thereby causing humiliation. Trick – trick them or manipulate them into doing things they wouldn’t do otherwise. Incarcerate – limit them either physically through acts like trapping them in the bathroom; or socially by spreading rumours about them or picking on other kids who try to be friends with that person. Intimidate – threaten the person or blackmail them. Deflate – demoralize the person or make them lose confidence by acts, words or gestures that are different from the other categories. 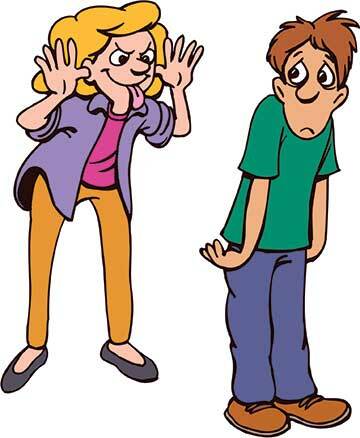 How can one identify if a complaint is a genuine case of bullying? Unwarranted – the alleged victim must not have taken part in it voluntarily. When kids play (wrestling/duelling), both sides indulge in violent activities voluntarily, this cannot be considered as bullying behaviour. Power imbalance – there must be a perceivable difference in power between the alleged bully and victim. The former must be relatively powerful. ‘Power’ can be identified in terms of – physical built, intellect, size of friends circle, etc. Other factors like socio-economic background, cultural dominance in the locale, legal sanctions (misuse of power by prefect for instance), possession of a specific article (cricket bat, game console, etc.) or a specific piece of information (written or electronic documents), etc. can also create power imbalance. Repetition – It becomes bullying if, and only if, these acts are repeatedly perpetrated by the same persons against the same persons. If it is a one-time incident it might fall in the domain of ragging. If it is the same perpetrator but different victims, it might be a case of trait aggression or naughtiness. The naughty kids don’t usually express their ‘talent’ on the same kid again and again. Intentionality – The perpetrator may indulge in such acts either with an ‘intention’ to hurt the receiver or with a ‘motive’. It happens in some cases that the perpetrator does it just because he/she thinks it is funny and is not aware of the negative impact it has. Either way it must be considered bullying behaviour. Negative impact – Bullying, in most cases, has a deteriorating impact on the physical health, appearance, property, academic performance, social acceptance, psyche (including self-esteem), sense of safety and well-being of the victim and the bully. It also causes a feeling of hurt and hatred towards oneself and a sense of detachment towards family, friends, and the school. How is it different from ‘ragging’? Ragging is unwarranted, aggressive behaviour, that involves intentionality, but it is mostly short-lived and the power imbalance is defined in very specific terms instead of an amalgam. Therefore, ragging must be considered different from bullying. 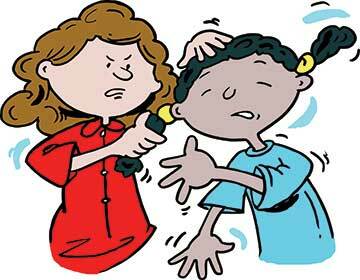 Ragging is a severe punishable offence whereas bullying is not recognized as an offence by any Indian law. How does one respond to complaints of bullying? The most important point to be noted is that both the victim and bully need attention. The bully must not be subject to the same punishments suggested by CBSE for ragging such as rustication. Both of them must be subject to regular counselling and the basic issues that lead up to bullying must be dealt with. Case history – No act of bullying happens in isolation. The teacher must get to know the case history of all acts and types of bullying that happened prior to the act that is reported. It might be true that one kid hit another, but this might have been an act of retaliation to the bullying (s)he was subjected to. Focus of attack – It is a specific attribute of the victim that the bully picks on. It may be the name or the surname of the victim; physical traits like height, weight, complexion, etc. ; socio-cultural or economic background; personal interests, taste, etc. If the focus is identified, the counselling can be directed towards making the student understand why it is wrong to do such acts or to think of oneself as inferior or superior because of the possession of certain attributes. Location – Bullying can happen virtually anywhere, including the electronic space. It can be within the classroom, the corridor, canteen, grounds or other places within or around the school campus, or even on the school bus or at the tuition centre. By knowing the location, the teachers can increase surveillance in those areas either by themselves or with the help of other staff members and parents. How can one prevent bullying behaviour in the class? It must be noted that most children are unaware of the fact that they are being bullied. For awareness purposes, the first three movies of Harry Potter can be screened and the relationship between different characters (Potter vs. Dudley, Potter vs. Malfoy, Ron vs. Malfoy, Hermione vs. Malfoy, Neville Longbottom vs. Malfoy) can be explored4. This can be an effective infotainment session. A positive environment of student-teacher interaction must be maintained so as to ensure higher reporting rates. Also, a confidential method of reporting must be followed. To publicly announce that someone is bullying someone is also a form of bullying! (busting, to be specific). Peace education and sympathy education must be promoted. The regular value education course could be tweaked to prevent bullying. More group activities must be conducted so as to promote inter-group relations and to avoid inter-group tensions and isolation of individuals. Also, the way preparation for a role play happens in a mixed group will give strong indicators of existing inter-group tension and isolation in the class. Students with low levels of activeness are vulnerable to bullying behaviour. They can be made to sit in high energy postures5 and the vice-versa is applicable for hyper active kids. Reminders and refresher activities must be undertaken both for students and the teachers on regular intervals (preferably once in each term) to make sure the initiative does not have a dampening effect. To combat bullying is an essential part of classroom management. Teachers need to understand and take affirmative action in their classrooms. This issue is of growing concern especially in recent times in light of globalization, increased media exposure, and digital media presence. Instances of bullying continue to threaten the physical and psychological safety of school-going children year after year6 and teachers can play a significant role in curbing this menace. See the news report: Bindu, S. P. (2014 September, 4). ‘Bullying rampant in Delhi schools’, The Hindu. New Delhi. From Promoting Relationships & Eliminating Violence Network (PERVNET) which is a joint research based social initiative of Queen’s University and York University, Canada. For more details: www.prevnet.ca/bullying/dangers. See Central Board for Secondary Education – Notification dated March 9, 2015 (Circular No. Acad.-17/2015). ‘Harry Potter in Bullying Prevention’ – is an awareness module (working paper). Log on to www.facebook.com/itaintok for updates. Amy Cuddy’s TED talk on ‘Fake it till you make it’ will give a better idea of how body language can be used as a technique in classroom management. Her TED talk is available on: https://www.ted.com/talks/amy_cuddy_your_body_language_shapes_who_you_are?language=en. This article was inspired by and draws on the findings of a semester-long group project that I undertook as a part of my under-graduate course work. I’d like to thank my project teammates Apoorva Verma, Shubhankar Goldar, and Tanvi Jain; and our mentors Dr. Achla Tandon and Dr. Sukrita Paul Kumar for their inputs. The author is a student at Delhi University’s Cluster Innovation Centre. He can be reached at c.divyadarshan@gmail.com, www.facebook.com/itaintok.